Among the most important post-disaster activities to be addressed in your business continuity and disaster recovery plans are financial preparations. Many things need to happen in the aftermath of a disaster in addition to protecting human life, recovering business functions and relocating to a temporary office space. Among the most important post-disaster activities to be addressed in your business continuity and disaster recovery plans are financial preparations. These financial arrangements ensure that employees and creditors are paid, as well as define other emergency financial arrangements that ensure there will be minimal financial impact to the organization post-disaster. We'll examine the financial activities to be addressed in your plans before, during and after an incident. Table 1 below provides a list of these actions. Business interruption insurance may provide yet another source of emergency funding following a disaster. Check with your insurance carrier(s) to determine what options are available. 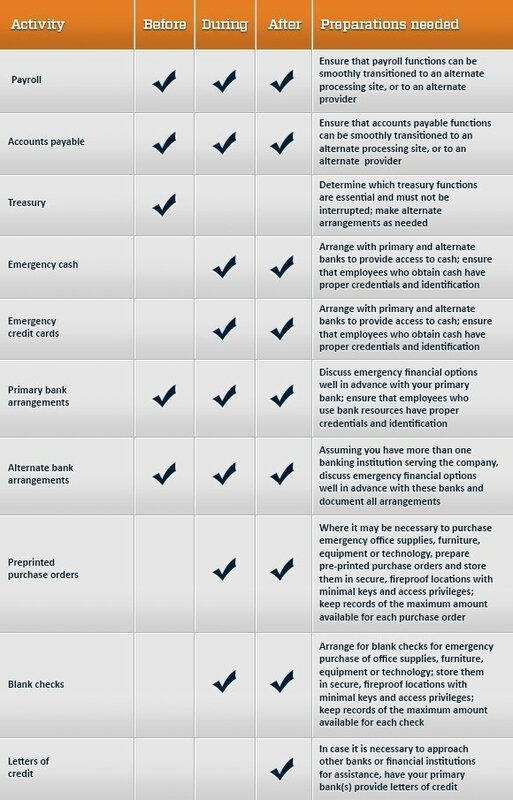 We have identified several key financial resources that you'll probably need to pay for emergency supplies and other resources. We also encourage you to provide alternate arrangements to have payroll, accounts payable and other essential financial activities processed with minimal interruption so employees and creditors can be paid. In such situations, regular communications with employees, creditors and other stakeholders will help minimize negative actions from these institutions so you can focus on getting back to business. Paul Kirvan, CISA, FBCI, works as an independent business continuity consultant and auditor and is secretary of the U.S. chapter of the Business Continuity Institute and member of the BCI Global Membership Council. He can be reached at pkirvan@msn.com.